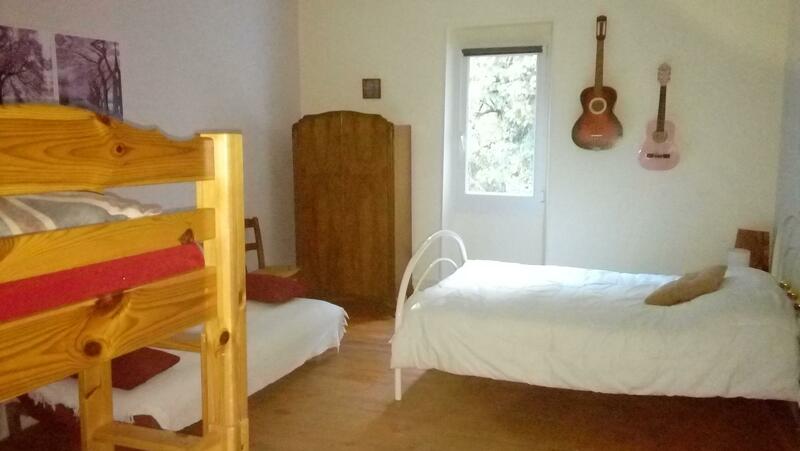 Ideal Chamber(room) of 4 places(squares) for the family with 1 double bed and 1 bunk bed. She(It) is situated on the second floor of the house right-hand side. Bathroom and collective TOILETS on the landing containing 2 TOILETS, 2 showers and 2 washbasins. Corner(Place) lounge(show), library(bookcase), games(sets), 1 double bed, 5 single beds, bathroom and TOILETS on the landing understanding(including) 2 TOILETS and 2 showers as well as 2 washbasins. Important: the payment by CB is not installed(settled) on the site thus the total regulation(payment) this done on site yet. For reservations superior to 1 overnight stay and understanding(including) one or several not used options, a deduction will be made.